Wow! I just got back from a lovely night stroll on the beach! I arrived this evening at Neah Bay & decided to come out to the festival location just to ensure I got cell & internet service. My plan was to then return to Neah Bay & come back out tomorrow on my lunch break & then work the remainder of the day. The nice people at the gate simply welcomed me in! So, I set up camp & took a little walk. Just beyond the stage where they were doing sound checks I heard what I thought could be the ocean! So I kept walking & within about 50 yards, there it was! So beautiful, even by the light of just my flashlight. The sound was higher pitched than I remember. I guess maybe because the waves right now are so small? It almost sounded like wind rustling through the trees. Obviously its been a while since I’ve been at the beach! So I’ve had fun learning about Sofia over the last few days. 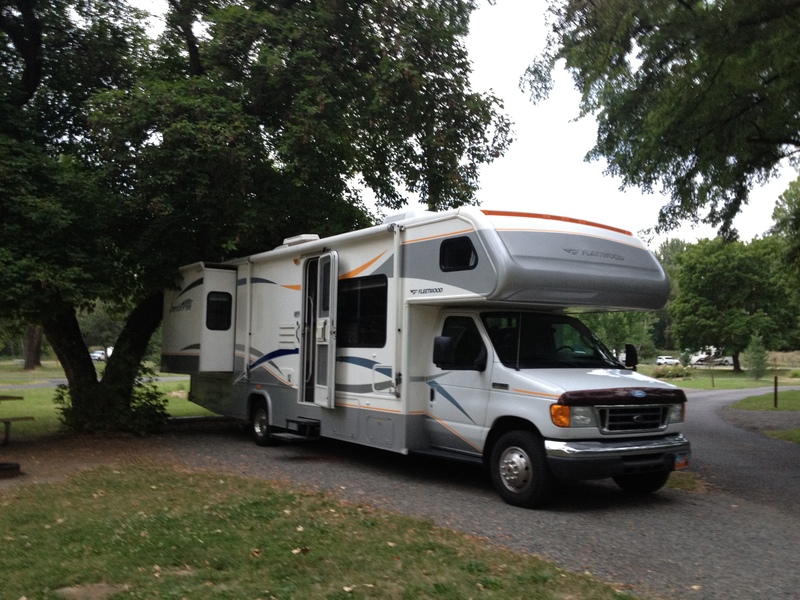 Most of you know that Sofia is the name I have given to my recently purchased RV. I think its like any relationship. It starts off with bliss and goes downhill from there. LOL! No, it really hasn’t been so bad. Just I realize she’s not quite as perfect as I thought she was. Isn’t that how it always goes? 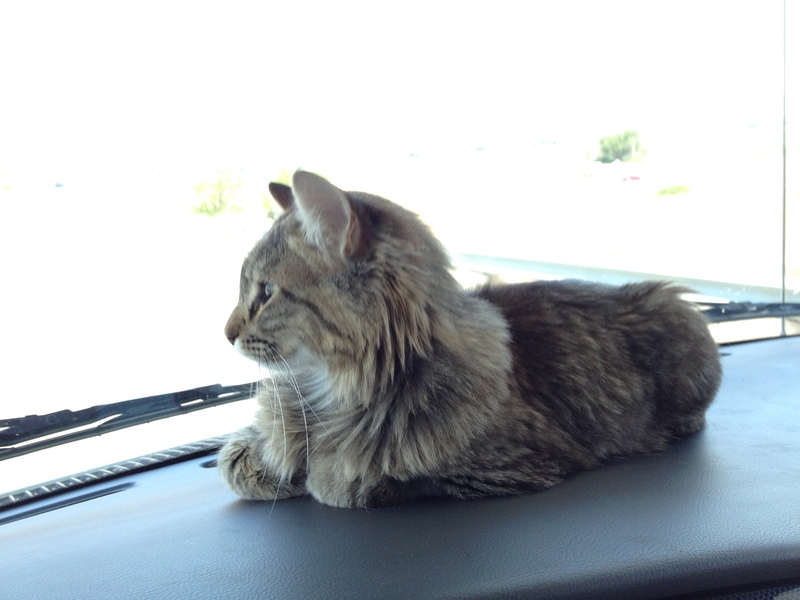 One cute thing I’ve learned is that Geb is not only a lap cat co-pilot, but he’s also a dashboard co-pilot. So adorable! And, he even knows he can’t come over to the dash on my side. He’s such a good kitty! Over E11 last weekend, we noticed that the A/C wasn’t working as well as it should be. On my drive from Mountain Home to Yakima as I worked throughout the day at various rest stops, I noticed it really wasn’t working. So I called & made an appointment for early Wednesday morning. When I took her in bright & early on my birthday, I learned that she needs a new A/C unit. Ah well… Trouble is no one in Yakima or Seattle seemed to have one. And so, I have an appointment scheduled at the end of the month when I’m in the Portland area. The good news is that I’m now over on the coast where its cool & I definitely don’t need the A/C! I actually even turned on my heater this morning. It works great! Some of our encounters have been positive however. For example, I’m getting really good at driving her! Even though my heel won’t touch the ground (even with the seat scooted all the way forward!). I never really realized that my legs were quite that short. Oh well. I asked about it when I was at the RV shop to see if there was some way to fix either my seat, the peddles, or maybe get some blocks or something. They said to try an auto parts store. So this evening as I wandered briefly through the cute little town of Sequim, I went into the auto parts store & inquired. Nope, no such thing is made because of the liability factor. He told me to “keep on driving like a ballerina on her toes”. I’m even getting pretty good at backing her up! The last two nights at the state park campgrounds I had to back her into her spot. AND I DID IT!! Without even hitting anything. LOL! And I had to turn around in a parking lot today after pulling in to take a picture. Managed that as well. Looking pretty good backed into that spot! So Tuesday night, I had just backed her into her spot at the nice state park in Yakima & gotten settled in. I remembered that during E11 I couldn’t get the oven to light. So I googled it (I don’t know what I would do if I didn’t have google!) & read that you can’t use the striker knob (that’s only for the burners), you have to light it with a match or long lighter. So I got my long lighter out & proceeded to try to light it. It just wasn’t working again & again. I was beginning to get a little worried that I might just eventually set off the whole place with a fire bomb if it ever did light. So I started looking around the oven a bit more just trying to figure out if I saw anything loose, etc. That’s when I realized… I had been attempting to light the temperature gauge rather than the actual pilot light. LOL! Once I figured that out, she lit up right away! Ah well… now I know! 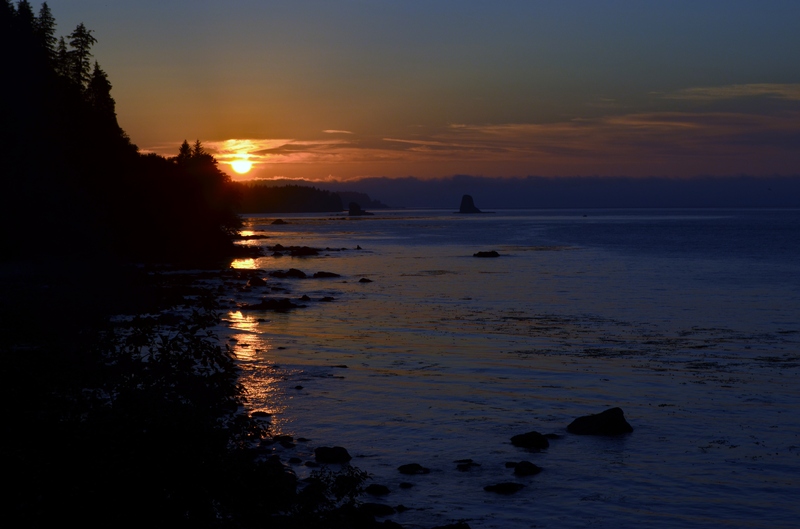 I’ve been to Neah Bay one time before… it was right before Michael (my 2nd husband) & I moved to Utah from Bellevue, WA. People always think Seattle is close to the coast, but in reality, its really a long way from the coast! Growing up on the Oregon coast, I had always wanted to go to the furthest most northwest corner of the continental United States. So before we moved out of the general vicinity, we did. I was pretty happy to have accomplished that goal. I remembered the road (Hwy 112) from Port Angles to Neah Bay as being a relatively long, narrow, winding road, but not terrible. Of course, that was in my mini! Driving that same road in Sofia, oh my! I really don’t remember the road to be THAT bad! Its super windy, super narrow, and has so many sink holes from slides that we were rocking, jiggling, & banging our way slowly down the road. There were lots of pullouts along the way, but the majority of the pullouts weren’t even big enough for Sofia! So slowly we carried on… And, in a way, it was like a pilgrimage coming back to this magical place. One good thing we’ve learned together is that traveling in the evenings as we do the traffic is much less than if we would travel during the day. It makes the traveling kind of nice to have pretty much open roads. Especially on roads like Hwy 112; I only had to pull over 2x in 60 miles to let anyone go around me. That’s pretty good! And, its good that no one was on the road with me tonight. I totally did the tourist thing! 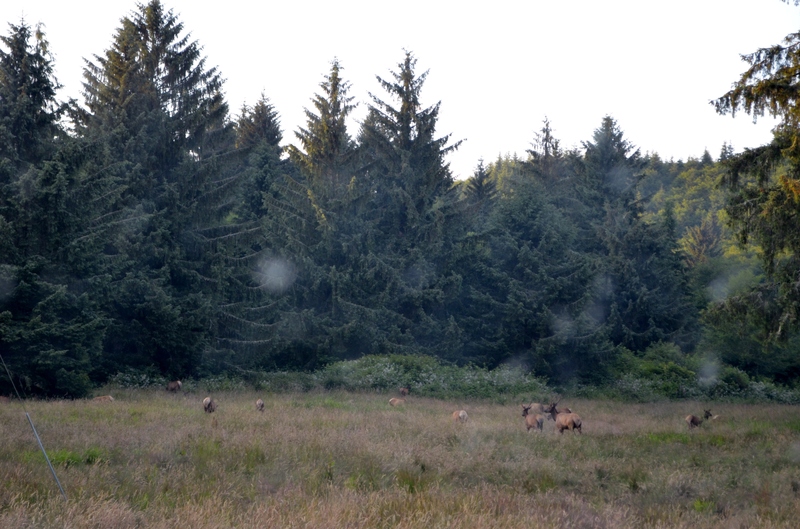 Yup, I stopped Sofia in the middle of the highway (there was no turnout spot around) and took this picture of the elk. LOL! Anyway, I’m happy to have finally arrived, to be in one spot for multiple days, and to enjoy the festival that starts tomorrow. I’m planning to get up early to take a walk on the beach before work. This entry was posted in Central Washington, Washington Coast by kariann1237. Bookmark the permalink.